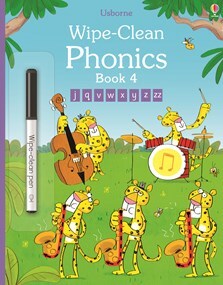 Children can practise the sounds and shapes of letters ‘j’, ‘q’, ‘v’, ‘w’, ‘x’, ‘y’ and ‘z’ as taught in schools in this fun phonics book. Activities include drawing v-shaped fangs onto a family of vampires, spotting everything beginning with ‘q’ and using ‘x’ to mark the spot on a treasure map. Then they can wipe the page clean and try again!